Saint Anselm College, located on a hilltop overlooking Manchester, N.H. provides students a distinctive liberal arts education that incorporates opportunities for professional career preparation. Debra Hesketh is the Supervisor of the Campus Mail Center, a "Mini Post Office" at the college. 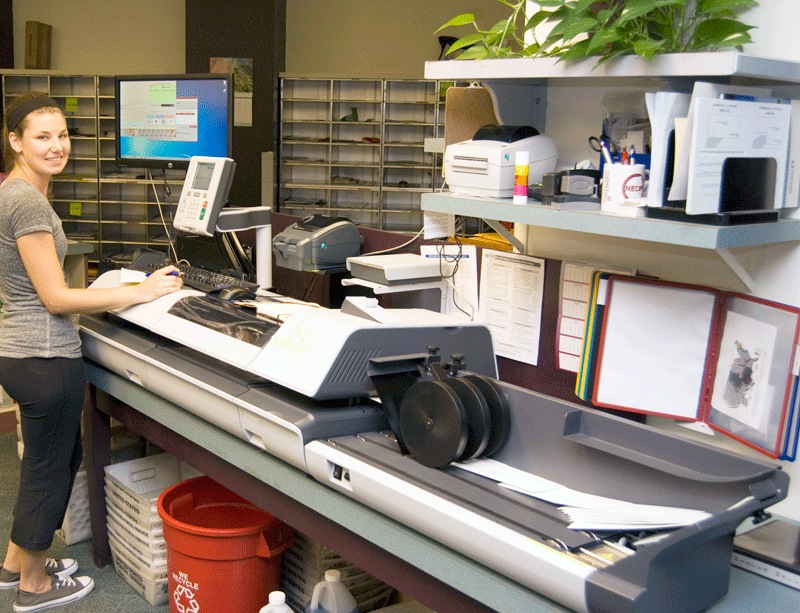 With outgoing mail of up to 10,000 pieces per month, she was looking for a mailing machine that would meet the school's demands. "When I first entered the department we needed to update our equipment because the Post Office was transitioning to the weight and base mailing system," Hesketh explained. Four years ago, after dealing with an inattentive vendor, the college was thrilled when Formax reached out. "The machinery and customer service from our old vendor was not adequate for our needs," Hesketh said. "We were invited to the Formax Facility in Dover and were very impressed. The way we were treated, the product, the price. Everything was excellent." Formax provided the college with the Hasler IM5000 mailing system and G2 software allowing them to mail and ship packages quickly, efficiently and economically. In May of 2015, Saint Anselm updated their equipment to the Neopost IS-5000. This robust machine delivers simple, ergonomic operations; reliable production, and maximum uptime. The college added the expandable conveyor increasing their capabilities. "It's great because if it's just one of us here running a bunch of mail at once, it expands way out," Hesketh said. The college also advanced to EMS (Enhanced Mailing & Shipping) Software. This new technology has helped them analyze their mail and shipping operations, pinpoint incorrect addresses, lost or late packages and identify opportunities to better manage costs and delivery options. "We're able to find the best carrier, best time and best rate," Hesketh explained. The address correction feature has helped eliminate the problems that lead to returned and misdirected deliveries, delayed deliveries and address correction fees. In addition, EMS has helped manage and allocate costs by account, carrier, special service, and operator productivity. "The transition to the new software was seamless," Hesketh said. Saint Anselm has been most pleased with the customer service that Formax provides. "With our past vendor, when our machine would break down, we would have to wait in excess of 24 hours for a technician to help us," Hesketh said. With the Formax 4-hour on-site response time the college can get the help they need, when they need it. "The technicians call us back immediately and many times can walk us through the issue over the phone," Hesketh stated. "Although, the need for service has been minimal," she added. Hesketh has been extremely impressed with the knowledge the technicians provide. "We've learned from them that if we hold our mail and send it all at once, rather than running the machine all day long, it saves on ink." The college has gone from purchasing an ink cartridge every other month to purchasing every six months. With new technology and a knowledgeable staff, Saint Anselm has been very happy partnering with Formax for their mailing needs.